Finnish Rippikoulu are supposed to be doom death legends in their own land, the band which released a breakthrough Musta Ceremonia umpteen years ago and remained dormant for more than two decades. Ulvaja demo is an unexpected comeback and resurrection of sorts. 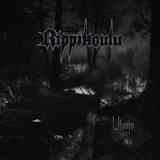 Rippikoulu allows angel voices last for all of 15 seconds on the opener Jaa Hyvasti Kaunis Kesa before beginning to plumb the unfathomable depths, yet doing it with rich thick guitar tone hiding a little of atmospherics just behind it. Production values exhibited by Rippikoulu on Ulvaja do not betray them as a band which has been away from the field for so long. From slow to still slower, this resonant dirge is solid on approach and substance, but does not provide enough desperation for me to wring neck and slit wrists, not until the song reaches onto another level after temporarily dissolving into a grand piano moment. It is that next level which Rippikoulu achieves on a taken out of context, ripped out of some music book sketch piece which is Loputon. The song, without any intro or outro, starts as if mid-way through a composition and brings the desperation message home with its up front tremolo. Closing title track then combines all of the successes of the previous two tracks, combining dense sonic wall, funeral procession, gloomy atmospherics, piano, male voice going from mere cackling to powerful growl and slight angelic female overtones to achieve a fully spiritual experience. Ulvaja on some levels touches Yearning first album With Tragedies Adorned, something which is truly a legend of Finnish doom death in my book. What somewhat concerns me, however, about Ulvaja is how Rippikoulu intend to distinguish their brand of “crushing” doom death of years past from the atmospheric sadness-laden doom death professed by so many these days. Like, say, Rippikoulu’s countrymen Shape of Despair, which Ulvaja can remind of quite a bit. Time to go dig that Musta Ceremonia album and compare Rippikoulu then and now.